Despite the initially almost shock-like atmosphere, people immediately started to document the ‘frozen’, sculpture-like performers through the video or photo function of their cell-phones. 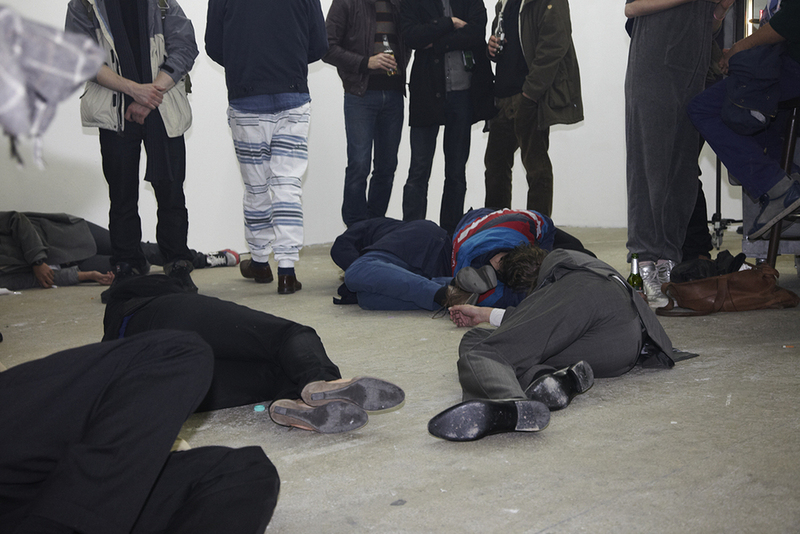 Only after a while some encouraged the performers to stand up again, and time even provoking them with more assertive interactions (such as laying down next to the performers). To Kruithof, Ruhe is more than a ‘constructed situation’ – it reveals and plays with the social need for and automatism in using network technologies, whether it is an artistic performance or a moment of precariousness. By including herself as well as her audience within the perpetually repeated mechanism of seeing and being seen, she questions society’s priority in looking, instead of acting. 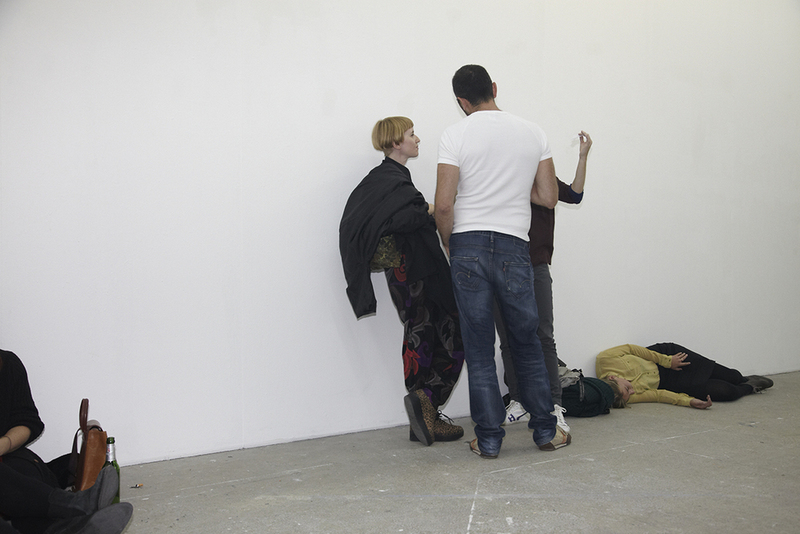 For Ruhe, a solo performance held at the Autocenter Berlin on September 29th of 2012, Kruithof casted 18 people directly on the street or through calls on amateur dance and theatre platforms. Within an empty art space hosting a reception, the performers were part of the audience impossible to be distinguished from the ‘ordinary’ visitors. After 2 hours of mingling, they received Kruithof’s collective text message including the word “ruhe” (“silence”) – their signal to collapse and remain motionless until they decided to stand up again (the last person got up after 35 minutes). This domino-like fall of the 18 performers caused different reactions in the audience – some people laughed, others felt uncomfortable, others even annoyed – and ultimately lead to a dead silence in the space.